One Step Ahead: Tax Time Can Be Scam Time! Penn’s Vice President and University Secretary Leslie Laird Kruhly has announced the 2017 honorary degree recipients and the Commencement Speaker for the University of Pennsylvania. The Office of the University Secretary manages the honorary degree selection process and University Commencement. Commencement Speaker: Cory A. Booker, a Democratic United States Senator representing the state of New Jersey, will be Penn’s 2017 Commencement Speaker on May 15, 2017. He and these six other will be presented with honorary degrees from Penn during the ceremony on Franklin Field. Cory A. Booker is a Democratic United States Senator representing the state of New Jersey. Born in Washington, DC, he was raised in Harrington Park, New Jersey, and has lived his life as a proud New Jerseyan. Senator Booker is a graduate of Stanford University, where he received his bachelor’s and master’s degrees and played varsity football. A Rhodes Scholar, Senator Booker also received a graduate degree from the University of Oxford, Queen’s College. After earning his JD from Yale Law in 1997, Senator Booker moved to Newark–where he still lives–and started a nonprofit organization to provide legal services for low-income families and tenants seeking to improve living conditions. In 1998, at the age of 29, he sought and won election to the Newark City Council. In 2006, he was elected the mayor of Newark. During his seven-year tenure, the city saw economic growth unmatched in decades and a significant decline in overall crime. Senator Booker also introduced new initiatives to improve education and public services and create new public parks and green space. Senator Booker was elected to the United States Senate in a special election in 2013, and was then re-elected to a full six-year term the next year. In the Senate, he has emerged as an across-the-aisle leader on issues such as criminal justice reform, ensuring support and resources for local law enforcement, comprehensive immigration reform and fostering economic opportunity for all Americans. Senator Booker serves on the Senate’s committees on Commerce, Science and Transportation; Small Business and Entrepreneurship; Environment and Public Works; and Foreign Relations. Senator Booker is the author of United: Thoughts on Finding Common Ground and Advancing the Common Good. Senator Booker will be receiving an honorary Doctor of Laws. Chilean-American author and human rights advocate Isabel Allende came to worldwide acclaim in 1982 at age 40 with her bestselling first novel, The House of the Spirits. The book, based on a farewell letter to her grandfather, established her as a feminist force in Latin America’s male-dominated literary world. Chile’s 1973 military coup had forced Ms. Allende, a prominent journalist, to flee with her family to Venezuela, where they remained in exile for many years. She eventually emigrated to the United States and settled in California in 1987. Today, her more than 20 fiction and nonfiction books and three memoirs, all written in her native Spanish, have been translated into over 35 languages, with over 65 million copies sold. Her works, many adapted for film, theater, opera and ballet, include Of Love and Shadows, Maya’s Notebook, Ripper and her latest, The Japanese Lover. Following the death of her daughter, Paula, Ms. Allende established the Isabel Allende Foundation in 1995 in her honor. The Foundation works on behalf of women and girls worldwide, supporting many nonprofit organizations that provide vulnerable women and children life-saving access to reproductive services, healthcare, education and protection from violence. Among many honors, she has received France’s Chevalier de L’Ordre des Arts et des Lettres, the Chilean National Prize for Literature, the Library of Congress Creative Achievement Award for Fiction and the Hans Christian Andersen Literature Award. The Times of London in 2009 named The House of the Spirits one of the “Best 60 Books in the Past 60 Years.” Ms. Allende received the 2014 Presidential Medal of Freedom. A US citizen since 1993, Ms. Allende speaks internationally on women’s rights and empowerment, Latin American and world politics, writing and spirituality. A member of the US Academy of Arts and Letters, her work also appears in newspapers and magazines throughout the United States and Europe. Clara Franzini-Armstrong is Professor Emerita of Cell and Developmental Biology at Penn’s Perelman School of Medicine. A pathbreaking scientist and educator for over 50 years, she is recognized as the world’s leading electron microscopist, making seminal and fundamental contributions to the understanding of muscle biology, particularly the structural basis of excitation-contraction coupling. The concepts developed and electron micrographs generated by Dr. Franzini-Armstrong’s work are standard inclusions in all major physiology and cell biology textbooks. Dr. Franzini-Armstrong has also been a leading influence over many years in promoting a culture empowering women in science at Penn and in the field of cell biology, offering mentorship and training new generations of scientists. A native of Firenze, Italy, Dr. Franzini-Armstrong as a student was one of the two the first electron microscopists at the University of Pisa. Her postdoctoral studies were completed with eminent Cell Biologist K.R. Porter at Harvard University, with physiologist R.J. Podolsky at the National Institutes of Health and with Nobel-winning biophysicist Sir Andrew Huxley in London. Before her arrival at Penn in 1975, Dr. Franzini-Armstrong held research and faculty positions at Duke University and the University of Rochester. She also served on the executive board of the Biophysical Society. In recognition of her and her husband’s independent work, a lecture series named for Clay and Clara Armstrong was established in 2014 by the Society of General Physiologists. Dr. Franzini-Armstrong received the 1989 K.C. Cole and the 2007 Founder’s Awards from the Biophysical Society and an honorary MD from the University of Pisa. A member of the National Academy of Sciences and the European Academy of Sciences, she is also a foreign member of the Royal Society of London and Accademia Nazionale dei Lincei of Rome. Dr. Franzini-Armstrong continues her active electron microscopy and training of young scientists. Terry Gross is the host and an executive producer of Fresh Air, the Peabody Award-winning weekday magazine of contemporary arts and issues and one of public radio’s most popular programs. Each week, over five and a half million listeners tune in to Fresh Air, which is broadcast on over 624 National Public Radio (NPR) stations across the country and Europe. In 2015 and 2016, the program was also the most downloaded podcast on iTunes. Ms. Gross is widely regarded for her insightful, in-depth interviews characterized by “a remarkable blend of empathy and warmth, genuine curiosity, and sharp intelligence,” according to The San Francisco Chronicle. A native of Brooklyn, New York, she received a bachelor’s degree in English and a MEd in Communications from the State University of New York at Buffalo. Ms. Gross began her radio career in 1973 at public radio station WBFO in Buffalo, where she hosted and produced several programs, including This Is Radio, a live, daily three-hour magazine program. In 1975, she joined Philadelphia’s WHYY-FM as the producer and host of Fresh Air. The program has been distributed nationally by NPR since 1985, first as a weekly half-hour program, and since 1987 in its daily, one-hour format. Ms. Gross has received many awards for her work, including the Corporation for Public Broadcasting’s Edward R. Murrow Award for her outstanding contributions to public radio, the Literarian Award from the National Book Foundation and the Authors Guild Award for Distinguished Service to the Literary Community. President Barack Obama presented her with a 2015 National Humanities Medal in recognition of her “artful probing of the human experience.” Ms. Gross is the author of All I Did Was Ask: Conversations with Writers, Actors, Musicians and Artists. Nursing research pioneer Ada Sue Hinshaw, with a career that spans over 50 years, is known as one of her field’s most impactful leaders. Named a Living Legend by the American Academy of Nursing in 2011, she is Dean Emerita of the Daniel K. Inouye Graduate School of Nursing at the Uniformed Services University of the Health Sciences as well as the University of Michigan’s School of Nursing. Her research on quality of care, patient outcomes, and positive nursing work environments has led to fundamental policy improvements in her field. Dr. Hinshaw received her undergraduate degree from the University of Kansas, an MSN from Yale University, and an MA and PhD from the University of Arizona. The first permanent director of the National Center of Nursing Research and the first director of the National Institute of Nursing Research at NIH, she was instrumental in establishing and securing dedicated nursing research funding for the nation. In 2008, Dr. Hinshaw left retirement to head USU’s Graduate School of Nursing, launching the Faye Glenn Abdellah Center for Military and Federal Health Care Research. The Center supports research and evidence based practices for the care of the deployed, the wounded, and their families. A member of the Institute of Medicine, now the National Academy of Medicine (NAM), and its Governing Council, she is the recipient of many awards, including the Health Leader of the Year Award from the United States Public Health Service, the Distinguished Leader Award from the National Institute of Nursing Research and the Walsh McDermott Award from the NAM. Dr. Hinshaw is a past president of the American Academy of Nursing, and a member of the American Nurses’ Association. Dr. Hinshaw also taught at the University of Arizona’s College of Nursing; the University of California, San Francisco, and the University of Kansas. A prolific academic author, Dr. Hinshaw is a frequent speaker in her field. American educator and civil rights activist Robert Parris Moses is president and founder of the Algebra Project, Inc., which prepares students who have performed in the lowest quartile on standardized exams to graduate from high school on time and ready to take on college mathematics. Mr. Moses received a BA in philosophy from Hamilton College in 1956 and an MA in philosophy from Harvard University in 1957. Mr. Moses directed the Student Non-Violent Coordinating Committee’s Mississippi Voter Registration Project from 1961-1964 and served as co-director of the Council of Federated Organizations. He was instrumental in organizing the Mississippi Freedom Democratic Party, which in 1964 challenged that state’s all-white delegation to the National Democratic Convention. Having formerly taught mathematics in Tanzania, Mr. Moses used his 1982 MacArthur Fellowship award to begin the Algebra Project. He is the recipient of numerous other awards and honors, including the Heinz Award for the Human Condition and the Puffin/Nation Prize for Creative Citizenship. Mr. Moses is co-author of the 2001 book Radical Equations—Civil Rights from Mississippi to the Algebra Project and co-editor of 2010’s Quality Education as a Constitutional Right—Creating a Grassroots Movement to Transform Public Schools. An adjunct lecturer at the NYU School of Law from 2012 – 2016, he was named a Frank H.T. Rhodes Class of ‘56 Professor at Cornell University in 2006 and served as a Distinguished Visitor for Princeton’s Center for African American Studies in 2011-2012. Mr. Moses has served on the Education Advisory Committee of the Mathematical Sciences Research Institute since 2004. A frequent keynote speaker nationwide, he is the subject of Dr. Laura Visser-Maessen’s 2016 biography Robert Parris Moses–A Life in Civil Rights and Leadership at the Grassroots. A native of County Armagh, Northern Ireland, poet, professor and critic Paul Muldoon has been described as “one of the great poets of the past 100 years.” On the faculty at Princeton University since 1987, Mr. Muldoon is the Howard G. B. Clark ’21 Professor and Founding Chair of the Peter B. Lewis Center for the Arts. He has also been the poetry editor of The New Yorker since 2007. A former radio and television producer for the BBC in Belfast, Mr. Muldoon served as professor of poetry at the University of Oxford, where he is an honorary Fellow of Hertford College. His first book, New Weather, was published when Mr. Muldoon was just 21 and a student at Queen’s University, Belfast. Today, he is the author of 12 major collections of poetry, including Gravel, for which he won the 2003 Pulitzer Prize, 2015’s One Thousand Things Worth Knowing, as well as Moy Sand, Maggot, Horse Latitudes, Hay, Mules and Quoof. He has also published a great many smaller collections, works of criticism, opera libretti, children’s books, song lyrics and radio and television drama. Mr. Muldoon’s work has been translated into 20 languages. He is a Fellow of the Royal Society of Literature, the American Academy of Arts and Sciences and the American Academy of Arts and Letters. In addition to the Pulitzer Prize, Mr. Muldoon has received many honors, including an American Academy of Arts and Letters award in literature, the T. S. Eliot Prize, the Griffin International Prize for Excellence in Poetry, the American Ireland Fund Literary Award, the Shakespeare Prize, the Aspen Prize for Poetry and the European Prize for Poetry. Much in demand as a reader and lecturer, he also occasionally appears with a spoken word music group, Rogue Oliphant. The National Institute of Diabetes and Digestive and Kidney Diseases (NIDDK) has awarded Penn Medicine a $12 million, four-year grant to establish the Human Pancreas Analysis Program (HPAP). “The past decades have seen a dramatic improvement in our ability to profile human tissues relevant to Type 1 diabetes at the genomic, epigenomic, protein and functional levels,” said Klaus H. Kaestner, the Thomas and Evelyn Suor Butterworth Professor in Genetics and associate director of the Penn Diabetes Research Center, in the Perelman School of Medicine at the University of Pennsylvania. HPAP is focused on procuring and phenotyping pancreatic tissues from individuals with or at risk for Type 1 diabetes, Type 2 diabetes or other types of pancreatic islet dysfunction characterized by changes in beta cell mass. The team will also promote additional analysis of samples, including sharing of biobanked HPAP tissues and the resulting multi-dimensional data with the diabetes research community through an open-access database. The Program is also collaborating with teams at University of Florida, led by Mark A. Atkinson, and Vanderbilt University, led by Alvin C. Powers, who are funded by a separate award. HPAP, the newest program in the NIDDK-funded Human Islet Research Network, will build upon well-established collaborations among Penn investigators. An unparalleled multidisciplinary approach, such as the mapping of the “immune atlas” of the pancreas and cutting-edge technology, such as single cell analysis by mass cytometry, are some of the program’s strengths. This and other technological platforms will allow researchers to study diabetes and pancreatic islets with unprecedented resolution, said the investigators. As a follow-up to the message that we sent earlier Sunday morning regarding the Administration’s executive order on immigration, I wanted to share with you a statement, issued by the Association of American Universities, that Penn strongly supports. Penn is an active member of the AAU, which represents the 62 most distinguished research universities in North America. The issue of immigration and a well-functioning visa system is a critically important one for all of higher education. At the same time as our dedicated staff and faculty here at Penn work with us to support the international students who are on our campus from affected countries and others, our team also is reaching out to our government officials to express concern about the negative impact that this order is causing for Penn and our country’s mission of higher education. The AAU statement (below), summarizes the concerns that we will be expressing to our government officials, and so I thought it important to share it with you. This is a summary of the annual report of The University of Pennsylvania Health & Welfare Program, Plan No. 503, sponsored by The Trustees of the University of Pennsylvania, EIN 23-1352685, for the period that began on July 1, 2015 and ended on June 30, 2016. This annual report has been filed with the Employee Benefits Security Administration, as required under the Employee Retirement Income Security Act of 1974 (“ERISA”). Please note that not all employees are eligible to participate in all of the benefits available under the Plan. Please consult your Plan materials for specific eligibility information. The University of Pennsylvania has committed itself to pay certain medical and prescription drug claims, dental benefits and long-term disability benefits incurred under the terms of the Plan on a self-insured basis. In addition, the Plan has a contract with CIGNA Health and Life Insurance Company to pay certain medical claims incurred under the terms of the contract. The total premiums paid for the plan year ending June 30, 2016 to CIGNA were $97,229. The Plan also has a contract with Standard Insurance Company to pay certain long-term disability benefits incurred under the terms of the contract. The total premiums paid to Standard Insurance Company for the plan year ending June 30, 2016 were $1,230,204. The Plan has contracts with Davis Vision and Vision Service Plan to pay vision claims incurred under the terms of the contract. The total premiums paid under these contracts for the plan year ending June 30, 2016 to Davis Vision were $684,344 and to Vision Service Plan were $368,166. The Plan has a contract with Aetna Life Insurance Company to pay life insurance, dependent life insurance and accidental death and dismemberment insurance claims incurred under the terms of the contract. The total premiums paid under this contract for the plan year ending June 30, 2016 were $7,310,420. The Plan has contracts with John Hancock Life Insurance Company and Genworth Life Insurance Company to pay long-term care claims incurred under the terms of the contracts. The total premiums paid under these contracts for the plan year ending June 30, 2016 to John Hancock Life Insurance Co. were $1,254,636 and to Genworth Life Insurance Co. were $821,807. 2. insurance information including sales commissions paid by insurance carriers. 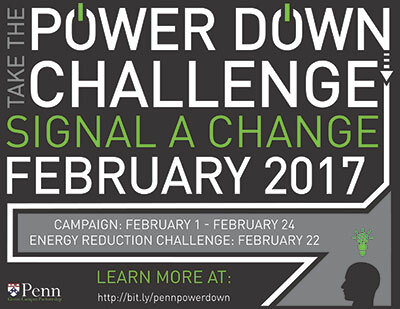 Penn’s Power Down Challenge is planned for February 1-24, 2017. Start thinking now about ways you can join this campus- wide energy reduction campaign! How can you encourage members of the Penn community to reduce their energy consumption and deepen their understanding of energy-related issues? The Power Down Challenge includes educational and interactive events, culminating in a campus-wide, 24-hour Energy Reduction Challenge on Wednesday, February 22. As in the past, Penn’s Sustainability Office will be awarding a donation prize to CURF’s Climate Action Research Grants based on the amount of energy saved during the 24-hour Energy Reduction Challenge. Last year, the campus reduced energy by 5.8% and the office was able to donate $5,800 for student research grants to advance climate research at Penn. 2017 marks the 20th anniversary of University City District (UD). 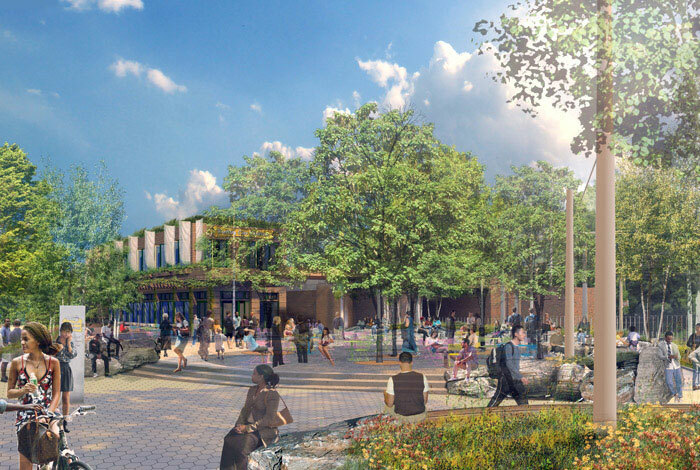 Over the next 12 months, it will be celebrating this momentous milestone with special events, reflections on University City’s growth and accelerating investments in the neighborhood’s future. As part of their celebration, they are pleased to launch 20 Years, 20 Stories, a multimedia series designed to share stories from the people who have made University City the vibrant, healthy and diverse community it is today. Those with reflections to share or an idea for a story UCD should tell are encouraged to contact UCD at ucd20@universitycity.org as they continue to collect new stories throughout the year. Each year Penn’s Way calls upon the strength of the Penn community to respond to the needs of those less fortunate. For this year’s Giving is Penn’s Way campaign you answered our call and then some! On behalf of the University and Health System leadership and our charitable partners from the Center for Responsible Funding, Penn Medicine and The United Way, we would like to say Thanks a Million! Thanks a million for your commitment to sending a message of hope and support to the vulnerable populations these agencies serve. Because of your generosity and compassion, the Penn’s Way 2017 Campaign met and exceeded its goal of $1,550,000! Our final total was $1,724,696. We especially applaud the hard work and enthusiasm of the many individual volunteers who served as Penn’s Way Volunteer Coordinators. Our deepest thanks to them and to you for making the Penn’s Way 2017 Workplace Giving Campaign another remarkable success! Thank you. Peter S. McDougall, WG’64, a former faculty member in the Wharton School at University of Pennsylvania, died on January 19. He was 76. Mr. McDougall received an MBA from Wharton in 1964 and a Juris Doctor from Rutgers School of Law in 1980. He worked at Wharton as a student and became a full-time personnel records officer in 1964. In 1970, he became the administrative course director in Wharton’s systems design training program. He joined the Dean’s office at Wharton in 1977 as a research administrator, a position he held until his resignation in 1981. Mr. McDougall then went on to work as an attorney for 37 years. He is survived by two sons, Scott and Greg; granddaughter, Laura; brother, Alan (Joan); sister, Janet; former wife, Nancy; nieces, Anne Burgess (Allen), Susan Balcerski, Beth Caputo (Anthony) and Laura McGuire (James); and nephews, Steven (Wendy), John (Andrea) and Arthur Collier (Christine). Beatrice “Bea” Nichols, who co-owned and managed University of Pennsylvania’s Museum Catering Company for more than 20 years, died on December 19, 2016. She was 67. Mrs. Nichols was born in Bern, Switzerland. She lived in Switzerland until 1973, when she and her husband Bruce moved to Philadelphia for him to attend graduate school at Penn’s Annenberg School of Communications. Mrs. Nichols taught French and German at Germantown Academy before taking a job at The Gold Standard. She opened her own restaurant, ECCO, at 17th and Lombard streets, in the mid-1980s. Through ECCO, the Nichols met Robert Dyson, then-director of Penn Museum, who encouraged the couple to open the Museum Catering Company (MCC). The Nichols opened MCC in 1989 and later secured an exclusive contract with Penn Museum. MCC hosted events including Book and Cook, the annual beer dinner featuring legendary beer aficionado Michael Jackson and University dinners with visiting dignitaries. The Nichols celebrated the 20th anniversary of MCC in 2009. Mrs. Nichols is survived by a brother, Marco (Jeannine); and a sister, Carla (Walter), her son and grandchildren. A Memorial Service celebrating her life is being planned for a later date at St. Marks Episcopal Church. José M. Regueiro, G’72, associate professor emeritus of Romance languages at the University of Pennsylvania, died on January 22 after a long battle with cancer. He was 78 years old. Dr. Regueiro was affiliated with the University for 47 years; first as a graduate student, then as an instructor, and from 1972 onwards, as a member of the standing faculty of both Romance languages and Spanish. He retired in 2015 (Almanac April 7, 2015). To date, Dr. Regueiro is the longest serving undergraduate chair in Spanish. He also served as graduate chair, managing editor of the Hispanic Review and director of the CGS Summer Program in Spain. He also represented Romance languages in the Faculty Senate. He is survived by his wife, Kathryn K. McMahon, director of language instruction in Romance languages at Penn; two sons, Miguel and Richard; and several grandchildren. Wednesday, February 22, 2017 at 4:40 p.m. Individuals who want to be assured of speaking at Council must inform the Office of the University Secretary (ucouncil@pobox.upenn.edu) by Monday, February 13, 2017. Please indicate the topic you would like to discuss. Those who have not so informed the Office of the University Secretary will be permitted to speak only at the discretion of the Moderator of University Council and in the event that time remains after the scheduled speakers. 1. Any member of the University community who wishes to do so may attend the Council meeting. Individuals who want to be assured of speaking at Council, however, must inform the Office of the University Secretary (ucouncil@pobox.upenn.edu) by Monday, February 13, 2017, indicating briefly the subject of their remarks. Those who have not so informed the Office of the University Secretary will be permitted to speak only at the discretion of the Moderator of University Council and in the event that time remains after the scheduled speakers. 2. Speakers should expect to be limited to three minutes with the possibility of additional time in cases where members of Council engage the speakers with follow-up questions or remarks. The Moderator may restrict repetition of views. Speakers are encouraged to provide Council with supporting materials and/or written extensions of their statements before, during, or after the Council meeting. 3. Following the deadline for speakers to sign up in the Office of the University Secretary, the resulting order of the Open Forum of University Council will be made available no later than the Tuesday before the meeting, to be published on the Office of the University Secretary website (http://www.upenn.edu/secretary/council/openforum.html) and, if deadline constraints allow, in The Daily Pennsylvanian and Almanac. 4. Speakers’ statements should be framed so as to present policy issues and directed to University Council as a body through the Moderator. The Moderator will have discretion to interrupt statements that are directed against persons and otherwise to maintain the decorum of the meeting, as provided for in the Bylaws. In cases where questions or positions can be appropriately addressed by members of Council, or where a colloquy would seem to be productive given the time constraints of the meeting, the Moderator may recognize members of Council to respond to speakers’ statements, with opportunities for follow-up by the speakers.Should the number of submitted topics of community-wide interest exceed what can be accommodated during a single Open Forum session, discussion will be allowed to continue at the following University Council meeting. Penn offers children, teens and young adults an array of summer activities from academics, enrichment and recreation—including anthropology, business, law, veterinary medicine and music—to more than a dozen athletic sports camps—from baseball to volleyball. For more information and applications, see the specific contact information below. Additional camps and programs may be available on the Penn Athletics website under Sports. Anthropologists in the Making: June 26-August 18. Penn Museum invites campers ages 7-13 to explore ancient and contemporary cultures through eight unique weeks of interactive gallery tours, art activities, scavenger hunts, games and special guest demonstrations. Monday-Friday, 9 a.m.-3 p.m.
June 26-30: Native American Voices. Discover a living tapestry of Nations with distinct histories and unexpected identities. Explore Nations of the Delaware Valley, sacred places and imaginative stories. Sample Native foods, write your own origin myth and design pottery. Research a culture and demonstrate your knowledge at a Showcase of Nations. July 3-7 (no camp on July 4): Let’s Dance. Whether it is for entertainment or spiritual purposes, dance has been an important aspect of human culture through the millennia. Learn how dance can be used to communicate with spirits, influence nature or honor an important life event. Learn some hip-hop moves, craft a rain stick and design a mask. July 10-14: I Dig Anthropology. Biological anthropology, cultural anthropology, linguistic anthropology and archaeology make up the branches of anthropology. Participate in activities that celebrate all four fields, from excavating a simulated dig site, to learning the development of the alphabet, to examining cultural values. July 17-21: Body Art. Scars, tattoos and piercings, oh my! Explore body modifications around the world and discuss their symbolic meanings. View ancient Mayan ear flares, African masks and Chinese foot binding shoes. Sculpt a Buddha and design your own tattoo. Showcase your knowledge at a Body Art Expo. July 24-28: Under Greek and Roman Skies. Do you love to stare up at the night sky? Learn about the contributions of the ancient Greeks to the field of astronomy. Explore Etruscan divination and Roman astrology. Draw your own constellation and create a story about its origins. Perform a planetarium show for your friends and family. July 31-August 4: Medicine: Ancient and Modern. Discover ancient Egyptian cures that are still used today. Learn about Chinese traditional medicine and how the Maasai curb malaria. Explore how medical technology is utilized to help conserve and interpret artifacts. Create a poultice, write a healing spell and fashion a shaman’s drum. August 7-11: Mummies Unwrapped. Get to know mummies from the land of Egypt and beyond. Make a Roman mummy portrait, create an animal mummy and a design a mask inspired by a Maori mummy. Visit In the Artifact Lab and chat with a conservator. You just might even touch a mummy! August 14-18: Daily Life in Ancient Rome. Learn about everyday people and life in ancient Rome. Explore family life, politics, worship and occupations. Create an ancient Roman menu and reenact a dining scene. Sculpt a dish, taste garum and piece together a mosaic. Registration opens: February 11. Register by May 1: $290/week, $270/members. Register after May 1: $310/week, $290/members. Pre-camp (8-9 a.m.) and after-camp (3-5 p.m.) care is available for additional fees. Call (215) 898-4016, email or visit the website. Morris Arboretum Summer Adventure Camp: June 26-August 4. At Morris Arboretum’s Summer Adventure Camp, thrill-seeking nature lovers ages 4-10 will find exciting adventures, experiments and crafts. Little Lightning Bugs is the Arboretum’s new program for 4- and 5-year-olds. Bloomfield Buddies is the program for campers ages 6-10. It will be held at the Arboretum’s Bloomfield Farm Barn, offering direct access to Springfield Mill, hiking trails, wetland habitats, honeybee colonies and wildlife. July 3-7 (no camp on July 4): Silly Science Fun. Transform into a mad scientist during this fun hands-on week of scientific discovery. Experiment with bubbles, make green slime and create messy science experiments. July 10-14: Paint, Sculpt, Play. Create nature-inspired paintings on canvases and watercolor paper, make animal sculptures out of clay and take mini expeditions around the Arboretum’s lush gardens. July 17-21: Animal “Tales”: Storytime and Art Explorations. Enjoy nature-inspired stories and fables in different garden locations throughout the week and make your own picture book inspired by the animal tales. July 24-28: An Ology A Day. Explore a different “ology” each day of camp. You will receive a crash course in science disciplines ranging from biology to archaeology, with fun craft projects and shoebox digs. July 31-August 4: Camp Nature Play. Skip, jump and play while exploring the gardens through scavenger hunts and mini hiking expeditions. This camp includes lots of games, including nature bingo, and crafts. June 26-30: Scientific Time Travelers. Experiment with microscopes while exploring scientific inventions and achievements of the past, present and future. July 3-7 (no camp on July 4): Grossology Grandeur. Explore the science behind all of the things that make you say “Yuck!” Conduct slimy experiments, dig for worms and get down and dirty in nature. July 10-14: Where the Wild Things Are. Get your hiking shoes on as we explore the Arboretum’s outback in search of Captain Fuzzy Bottom and friends—our groundhog Adventure Camp mascot. July 17-21: Raiders of the Lost Arboretum. Become an archaeologist on the grounds of the Arboretum’s Springfield Mills. Learn about local geology, conduct shoebox digs and discover 19th and 20th century life at Springfield Mills. July 24-28: Arts & Nature Poetry Jam. The sounds and sights of nature at the Arboretum will be the muse and inspiration for campers to write, paint and create. Keep a nature field journal, write and recite poems and paint on canvases. July 31-August 4: Nature Ninja Warriors. Enjoy lots of summer fun and physical activitiy with hiking expeditions, games, scavenger hunts, dance parties and more. Each session runs Monday-Friday, from 9 a.m.-3 p.m. Early bird registration: January 30-March 15. Cost: $238/week, $255/non-members. Cost after March 15: $280/week, $300/non-members. For more information or to register, click here. Penn Band Summer Music Camp: July 9-15. This program exposes wind, brass and percussion instrumentalists in grades 8-12 to music and mirth on Penn’s historic college campus. Participants perform a diverse repertoire of challenging and gratifying band music. A low student-to-instructor ratio is maintained to ensure a high level of instruction and attention to each student. The program includes guest lectures on topics in student leadership, group-building and conducting. Cost: Overnight track, $925; Commuter track, $462; 10% faculty-staff discount. Register online. John Yurkow Baseball Camps: Penn employees, call (215) 746-2325 for a discount. Register online. High School Baseball Prospect Camp: June 12-13; camp for 9th-12th graders will consist of instruction and competitive games for a true college baseball experience. Cost: $405. Youth Quaker Baseball Camp @ Meikeljohn Stadium: Session I: June 19-22; Session II: July 17-20. 9 a.m.-3 p.m. An organized and structured camp that focuses on preparing young players (ages 7-13) to refine their game. Competitive and challenging drills will be performed every day. Cost: $275 with discounts for Penn employees. Email. Penn Basketball Camps: Register online. Steve Donahue’s Quaker Elite Basketball Camp: June 17, 24 and 25; and August 12. College-caliber camp for serious high school players who are interested in playing at the collegiate level. Cost: $150/session. Steve Donahue’s Quaker Basketball Day Camp: June 26-30. Instructional day camp where boys ages 7-16 learn the fundamentals in the historic Palestra with Penn’s coaching staff and players in a fun environment. Cost: $225 per camper with discounts for Penn staff or parents families with multiple campers. Steve Donahue’s Quaker Basketball Twilight Camp: June 5-21. A series of six two-hour sessions on Mondays and Wednesday evenings. High school players looking for individualized instruction will work with college coaches. Cost: $200/6 sessions. Women’s Elite Basketball Camp: Session I: June 23-24; Session II: August 12. Rigorous program for highly motivated female student-athletes with the will and desire to play basketball at the collegiate level. Open to all girls in grades 9-12 as of September 2016. Register online. Penn Elite Field Hockey Camp: July 5-7. Camp will challenge players to elevate their game to the next level with high-intensity skills sessions and games reflective of collegiate play. Open to all high school age players. Cost: $530/overnight, $475/commuter. Click for information. Ray Priore Football Camps: Specialist Camps for Kickers/Punters: June 22 and July 13. One-Day Clinics: June 23, 24 and 25; July 7, 8 and 14. Camp activities are structured to resemble Penn’s football practices. Athletes will be challenged and will compete in drills aimed at developing proficiency in each position. Open to participants entering grades 9-12. Cost: $75/kicking clinics; $150/one-day clinics. Register online. Quaker Developmental Team/Individual Lacrosse: July 11-13. Designed to enhance individual fundamentals and overall skill set of players. The staff is comprised of Penn players and coaches who will run each session like a college practice. Open to boys entering grades 9-12. Cost: $665/resident, $550/commuter. Register online. Girls’ Elite Lacrosse Day Camps: June 26 and 27 and July 6. Provides an intense and challenging experience for girls entering eighth grade through pre-college. All sessions will be run like a college practice by top college coaches. Register by February 1: $200 per camp. Register after February 1: $250 for one day camp, $225 per camp for two or more. Apply online. Quaker Rowing Camp: Session I: July 16-20; Session II: July 23-27. For experienced and novice rowers (ages 13-18) looking to significantly improve their rowing ability. Instruction and coaching will be geared to the experience level and talents of each camper. Includes two daily practices on the water as well as active seminars on erg training and body circuits. Click here for cost and registration. Rudy Fuller Soccer Camps: July 31-August 4. For boys and girls in grades K-5. These Junior Quaker Camps offer players of various skill levels the opportunity to improve their soccer skills. Development of individual skills taught through fun exercises, daily competitions and small games. Cost: $300; discounts available. Register online. Penn Softball Camp: Session I: June 13; Session II: June 19-20. For serious players, ages 13-18. Camp activities are structured similar to Quaker Softball team practices. Athletes will be challenged with new drills and skills that will improve their offensive and defensive fundamentals. They will participate in competitive and challenging game simulations that expose athletes to situations that will build their softball IQ. Athletes will be held to high standards that push them to excel and maximize their potential. Cost: $150/day with $20 discount for multi-session registration. Contact: Dani Gonzales, (215) 898-6832 or email. Click here for details and registration. Quaker Swim Camp: Session I: June 19-23, Session II: June 26-30, Session III: July 10-14. A beginner to intermediate swim camp focused on quality drill work and proper swimming technique for swimmers ages 6-16. Cost: $425/competitive; $450/learn to swim; $400/two or more family members. Contact: Mike Schnur. Penn Tennis Camp: Session I: August 14-18; Session II: August 21-25; Session III: August 28-September 1. A day camp for players of all experience levels, ages 5-17. Each one-week session will focus on stroke production and technical skills while incorporating sportsmanship and teamwork. The camp runs Monday-Friday, 9 a.m.-3 p.m. Cost: $420/week for one or two weeks; or $375/week for three weeks. Register online or call (215) 315-3130. Penn Track & Field Camp: July 1. 10:30 a.m.-3:30 p.m. at Franklin Field. Open to students ages 10-18. Cost: $150. Register online. Penn Volleyball Camps: Players are grouped by skill and age level to maximize their potential and improve to the next level of play. Campers benefit from extensive, top-notch training in the areas of individual skill progressions, team systems and competition drills. Register online. Penn Volleyball Clinic Series: July 31-August 3; morning and afternoon sessions available. Open to girls ages 8-18. Penn Volleyball Summer Camp: August 3-6; overnight and day programs available. Open to girls ages 12-18. Art: Summer at Penn: July 3-28/day program, July 2-29/residential program. PennDesign offers a four-week intensive studio summer art program for high school students. The program prepares students for the college admissions process as they experience life while strengthening their portfolios. Courses are held within the School of Design’s fine art studios. Deadline: rolling admissions. Cost: $6,250. Apply online. Architecture: Summer at Penn: July 3-28/day program, July 2-29/residential program. PennDesign offers a four-week intensive studio summer art program for high school students. The program prepares students for the college admissions process as they experience life while strengthening their portfolios. Courses are held within the School of Design’s fine art studios. Deadline: rolling admissions. Cost: $6,495. Click here to email. Apply online. Penn Summer Science Initiative for High School Students: July 10-August 4. A free, four-week summer program for students entering their junior or senior year of high school, in materials science and engineering. The program consists of lectures on materials, a computer lab, experimental labs and field trips to both industrial and Penn facilities. Deadline: April 15. Apply online. Provost Summer Mentorship Program: July 5-August 4. The Provost Summer Mentorship Program is a four-week college preparatory and career exploration program providing hands-on experience through custom curricula in one of five Penn professional schools: School of Dental Medicine, School of Engineering & Applied Sciences, Penn Law, School of Nursing and School of Medicine. The program is open to current 10th grade students from Philadelphia School District only. Registration opens: February 10. Contact: Gail Oberton at (215) 898-8242 or email. Information online. Teen Research and Education in Environmental Science (TREES): June 26-August 11. Hosted by the Center for Excellence in Environmental Toxicology, TREES offers rising sophomores, juniors and seniors from local high schools a unique, hands-on research experience, lectures in environmental science, field trips and more. Students develop their own research projects. The tuition-free program lasts for about eight weeks. Deadline: March 1. Apply online. Penn GEMS Camp (Girls in Engineering, Math and Science): July 24-28. The School of Engineering & Applied Science’s Penn GEMS program is a week-long day camp targeted at girls finishing sixth, through eighth grades who are interested in math, science and engineering. Students work with faculty and students in bioengineering, materials science, graphics and computing. A special robotics-only track is also available. Registration opens January 30. Deadline: March 31. Cost: $625. Apply online. Contact by email. iD Tech Camps: Co-ed, week-long, daytime camps are held for ages 7-12 in June, July and August. Participants learn code, game design, app development, web design, film, photography and more. Courses are designed to build critical science, technology, engineering and math (STEM) skills. Cost: $849-949 per session. Register online. Summer VETS (Veterinary Exploration Through Science) Program: College/post-bac: June 12-16 and June 19-23; current high school juniors/seniors: July 10-14 and July 17-21; Monday-Friday, 9 a.m.-4 p.m.Offered by Penn’s School of Veterinary Medicine, the Summer VETS Program gives students the opportunity to take part in labs and lectures and shadow through clinics with fourth-year veterinary students at the Matthew J. Ryan Small Animal Hospital. Cost: $975. Deadline: April 3. Visit the website for more information. Julian Krinsky Summer Internship Program: June 25-July 15 and July 16-August 5. Depending on their chosen field, students spend three or six weeks working in an office, lab, studio, museum, sports venue or hospital, where they learn about the field, get work experience and live on campus at Penn. Transportation is provided to and from work. For rising high school juniors and seniors. Cost: $5,790/session. Deadline: rolling admissions. Apply online. Engineering Summer Academy at Penn (ESAP): July 2-22. Sponsored by Penn Engineering, ESAP offers an opportunity for rising sophomores through seniors to experience rigorous and challenging college-level coursework. The Academy’s intensive, three-week program combines sophisticated theory with hands-on practical experience in cutting-edge technologies such as biotechnology, computer graphics, computer science, nanotecnology, robotics or engineering complex networks. Open to rising sophomores, juniors and seniors. Priority deadline: February 24; final deadline: April 24. Application fee: $75. Cost: $7,375; financial aid available. Click here to email. Apply online. Penn Summer Academies: July 2-22. Open to rising sophomores, juniors and seniors. Cost: $4,200; financial aid available. Deadline: May 15, or until Academies reach capacity. Apply online. Biomedical Research Academy: Introduces students to the experimental basis of biology, including relevance to disease. Morning lectures cover the cellular, molecular and genetic aspects of biology, while afternoons are spent in the laboratory with hands-on experiments that introduce students to the tools and techniques used in biomedical research labs. Chemistry Research Academy: Provides students with hands-on experiences in cutting-edge research projects in the chemical sciences, including synthesis and characterization of new compounds and materials, chemistry of life processes, spectroscopy and environmental photochemistry, nanoscale materials and molecular devices. Experimental Physics Research Academy: Focuses on modern physics with an emphasis on hands-on experience and laboratory work. Program topics include mechanics, electromagnetism, quantum dynamics and astrophysics. Neuroscience Research Academy: Introduces students to the biological foundations of the brain. Morning and afternoon lectures address important neuroscientific topics, progressing from the cellular foundations of the neuron, to an understanding of the sensory systems, and culminating with higher-order cognitive functions such as memory, emotion and morality. Social Justice Research Academy: Students examine the historical importance and contemporary relevance of struggles to overcome inequality and injustice using past and present examples, such as peasant revolts, slave rebellions, anti-colonial and anti-apartheid independence movements, the Arab Spring, the Occupy movement and ongoing human rights campaigns. Penn Summer Young Scholars Program: Session I: May 22-June 28; Session II: June 29-August 4. This commuter program is an opportunity for academically exceptional local high school students to take college courses with Penn students and earn full college credit. Young Scholars can pursue their favorite discipline beyond the level offered in secondary schools, get a head start on their college requirements or explore a brand-new field that interests them. Open to rising juniors and seniors. Deadlines: Session I, May 1; Session II, June 1. Apply online. Penn Law Pre-College Summer Academy: July 2-22. This residential academy is designed to give motivated rising high school juniors and seniors, as well as college freshman and sophomores, clear insight into US law and the legal profession. Deadline: rolling admissions. Cost: $7,999. Apply online. Penn Medicine Summer Program: July 2-29. A residential medical program (part of Julian Krinsky Camps & Programs) for rising high school seniors. Students are guided and taught by Penn Medicine faculty and staff and are immersed in the world of medicine as they explore the career possibilities available to medical students. Cost: $7,695/session. Deadline: March 10. Apply online. Leadership Education and Development (LEAD) Program at Wharton: July 2-22. The LEAD Program introduces youth of diverse backgrounds to key areas of business. First established at Wharton in 1980, the program features lectures by corporate executives and Wharton faculty, team-based assignments and visits to businesses in Philadelphia, Washington, DC and New York City. Cost: $2,000/two weeks; $3,000/three weeks. Deadline: February 15. For more information, call (215) 261-7001. Apply online. Leadership in the Business World (LBW): July 2-29. LBW is a program for talented and ambitious rising seniors in high school who want to learn about leadership in business. LBW features classes with Wharton professors, lectures from prominent business leaders, site visits to businesses in Philadelphia and New York City and team-based activities designed to enhance leadership skills. Cost: $7,500. Deadline: February 3. Apply online. Management & Technology Summer Institute (M&TSI): July 2-22. M&TSI is a for-credit summer program for rising high school seniors and a select few rising high school juniors interested in exploring the integration of technological concepts and management principles. The program features classes taught by leading faculty and successful entrepreneurs, field trips to companies and R&D facilities, intensive team projects, as well as other activities designed to give students the opportunity to learn about the principles and practice of technological innovation. Cost: $7,000. Registration opens: March 1. Apply online. Wharton Sports Business Academy (WSBA): WBSA provides an opportunity for talented rising high school juniors and seniors to study sports business leadership at the Wharton School. This program teaches students about ownership, sports agents, marketing, media and labor as they meet and learn from leaders in the sports business world. Cost: $7,695; financial aid available. Deadline: February 20. Apply online. Global Leadership & International Affairs: July 2-29. The residential program (part of Julian Krinsky Camps and Programs) features debate, public speaking, research workshops, social entrepreneurship, realistic United Nations simulations and guest speakers. Participants enjoy field trips to the United Nations in New York City and Embassy Row in Washington, DC, and experience culture through cuisine in Philadelphia. The program is designed to accommodate both new and experienced students, ages 14-18. Cost: $7,200. Deadline: rolling admissions. Apply online. Wharton Moneyball Academy: July 23-August 5. Students will learn the “Moneyball” method which focuses on using data to make deep discoveries that are not obvious and certainly go against conventional wisdom. When it comes to sports, they will become data driven decision makers. As they learn statistical reasoning as well as key data analysis skills, they will be primed to be leaders in an increasingly data driven economy. This program is ideal for students with a strong background in math and a love of sports. An interest in computer programming is recommended but no specific background is necessary. Cost: $3,995; financial aid available. Deadline: rolling admissions. Apply online. Institute for Academic Studies (IAS): Session I: July 3-28 (deadline: May 26); Session II: August 1-25 (deadline: June 23). Offered by the English Language Center, IAS provides a foundation for university-level English. Students receive an introduction to academic content-based language and experience life and culture at a US university. Guest lectures from Penn professors offer students a unique university experience. For students at least 18 years old with a language proficiency at the CEFR level of B1- as demonstrated by TOEFL iBT of 57+, TOEFL PBT of 487+, IELTS of 5.5+, or TOEIC of 550+. Cost: $2,998/session. Apply online. Institute for Business Communication (IBC): July 3-28 (deadline: May 26) and August 1-25 (deadline: June 23). Offered by the English Language Center, IBC assists students in improving their business knowledge and communication. By using real-world business issues and topics, the program helps students enhance their professional skills. Guest lectures from Penn professors offer students a unique university experience. For students at least 18 years old with a language proficiency at the CEFR level of B1- as demonstrated by TOEFL iBT of 57+, TOEFL PBT of 487+, IELTS of 5.5+, or TOEIC of 550+. Cost: $2,998/session. Apply online. Editor's Note: For additional summer camps, see Almanac February 14, 2017 and Almanac March 14, 2017. 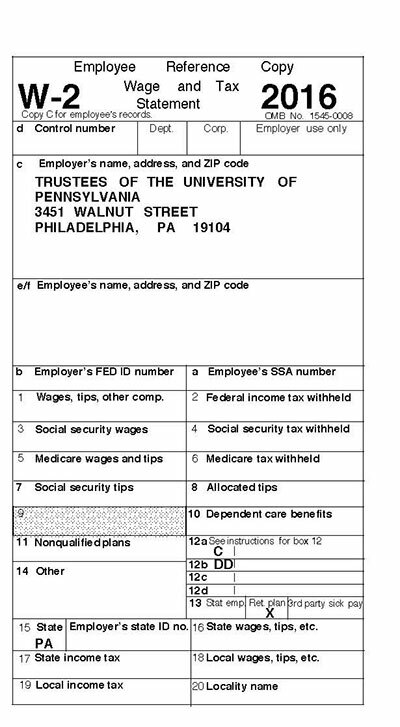 University of Pennsylvania is required by the Internal Revenue Service (IRS) to furnish all employees with a Form W-2 (Wage and Tax Statement) to report the employee’s compensation and tax withholding amounts for the calendar year, on or before January 31 of the following year. If you did not “opt out” of printing your W-2 Form, then the W-2 Form was mailed to your permanent address as it appeared on the Payroll/Personnel File (Employee Database). If your permanent address was not completed on the Payroll/Personnel File, the W-2 Form was mailed to your current address. Whether you chose to opt out or not, you can still access your W-2 form online by following the instructions listed below. Form 1042-S is created for anyone considered a nonresident alien for US tax purposes who received payments from Penn for fellowship/scholarship, independent contracted services or royalties as well as anyone with a benefit under a tax treaty with their resident country. Form 1042-S is sent to the local address for any active employees or students and to the foreign address for anyone who has since left the University on or before March 15 of the following year. Form 1042-S is available online for individuals. Please contact the Tax Helpdesk for information. Tax and International Operations can only provide information related to general tax questions. For assistance with the information reported on Forms W-2, 1042-S, and Non-service Fellowship letter, please contact the Tax Helpdesk at https://www.finance.upenn.edu:44301/apps/TaxHelpDesk/ or (215) 898-6291. As part of the Affordable Care Act, employers must provide employees eligible for health care coverage with the 1095-C form – an annual statement describing the insurance available to them. This year, benefits-eligible Penn employees will receive a 1095-C form in late January by mail. Your form will also be available online on January 31, 2017 in the My Pay section of the secure U@Penn portal at www.upenn.edu/u@penn Select “My 1095-C form” to access yours. If you receive a Form 1095-C from Penn, be sure to keep it for your records. You don’t need the Form 1095-C to file your taxes. Like last year, you’ll need to indicate on your tax return if you had qualifying health coverage. If you have specific questions about the Form 1095-C, please call the Equifax Call center at 1-(855)-823-3728. 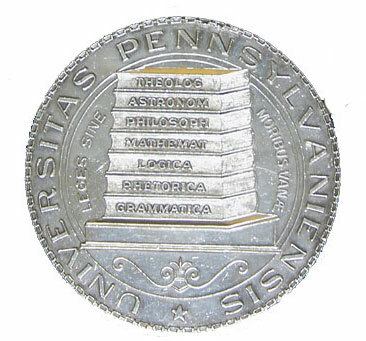 Penn’s Employer name or code is 10476. For general questions about the Form 1095-C, visit the IRS website at www.IRS.gov or consult your tax advisor. The federal withholding tax tables for 2017 can be found in the IRS Publication 15 at: http://www.irs.gov/pub/irs-pdf/p15.pdf Supplemental Pay Withholding: Withholding on payments less than $1 million in a calendar year remains at 25% for 2017 and withholding for payments in excess of $1 million in a calendar year remains at 39.6%. The Social Security Administration (SSA) has announced that the 2017 social security wage base will be $127,200, an increase of $8,700 from 2016 wage base of $118,500. The FICA tax rate will remain the same at 6.2% for the employee portion to match with the employer portion. There is no limit to wages subject to the Medicare Tax; therefore, all covered wages are still subject to the 1.45% until an employee reaches $200,000. Then, an additional .9% to the employee Medicare Tax will be withheld for the employee portion only. The maximum Social Security Tax that employees and employers will each pay in 2017 is $7,886.40. This is an increase of $539.40 from the 2016 maximum tax of $7,347.00. If you have questions or require additional information, please contact the Tax Helpdesk at https://www.finance.upenn.edu:44301/apps/TaxHelpDesk/ or (215) 898-6291. Registration is now open for the fourth annual Million Dollar Bike Ride on Saturday, May 20, to raise money for rare disease research, organized by the Penn Orphan Disease Center. The ride starts and finishes at Highline Park, 31st & Chestnut Streets. Online registration is open until midnight on Sunday, May 14. Early registration fee: $25 (must raise at least $250 before the event); fundraising cyclists will receive an official 2017 Million Dollar Bike Ride cycling jersey and a T-shirt. Must register by March 10 to receive the jersey at the event. Walk-up registration ($100) is available at the Class of 1923 Penn Ice Rink on Friday, May 19 from 4-7 p.m. and on Saturday, May 20 at 6 a.m. 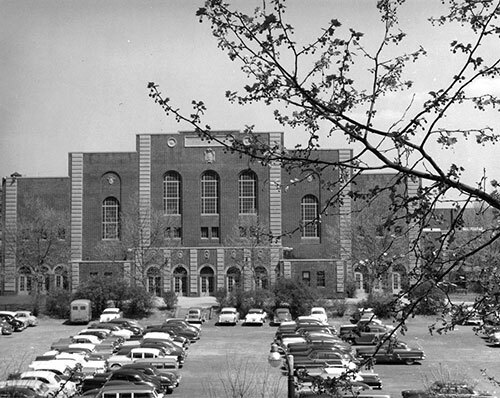 The Palestra (below, in 1956)—the oldest major college arena still in use and the famous home of Philadelphia Big 5 basketball (Penn, La Salle, Temple, St. Joseph’s and Villanova)—was opened on January 1, 1927, when Penn men’s basketball defeated Yale 26-15. Designed by Charles Klauder and constructed during 1926, the building remains a historic landmark both on the Penn campus and in the history of American basketball. The Institute of Contemporary Art (ICA) at the University of Pennsylvania presents The Freedom Principle: Experiments in Art and Music, 1965 to Now. This large-scale group exhibition links the vibrant legacy of avant-garde jazz and experimental music of the late 1960s (particularly within the African American arts scene on the South Side of Chicago) and its continuing influence on contemporary art and culture today. The exhibition occupies the entire museum and is on view until March 19. The Penn Center for Philosophy, Ethics and Public Affairs will be hosting Trump, Philosophy, and American Politics: Philosophical Implications of the 45th Presidency. This half-day conference on February 3 brings together scholars to discuss issues raised by the election, the transition from Obama Administration to Trump Administration and the early days of a Trump presidency. Speakers will examine the future rule of law, media, post-truth politics, race in the election and much more. This event at Claudia Cohen Hall on Friday, February 3, from noon to 6 p.m. is free and open to the public. Quayshawn Spencer (University of Pennsylvania): The Rise of Trump... How Did Race Matter? About the Crime Report: Below are all Crimes Against Persons, Property and Crimes Against Society from the campus report for January 16-22, 2017. View prior weeks' reports. —Ed. This summary is prepared by the Division of Public Safety and includes all criminal incidents reported and made known to the University Police Department between the dates of January 16-22, 2017. The University Police actively patrol from Market Street to Baltimore Avenue and from the Schuylkill River to 43rd Street in conjunction with the Philadelphia Police. In this effort to provide you with a thorough and accurate report on public safety concerns, we hope that your increased awareness will lessen the opportunity for crime. For any concerns or suggestions regarding this report, please call the Division of Public Safety at (215) 898-4482. Below are the Crimes Against Persons from the 18th District: 14 incidents with 2 arrests (8 robberies, 2 indecent assaults, 2 assaults, 1 domestic and 1 domestic assault) were reported between January 16-22, 2017 by the 18th District covering the Schuylkill River to 49th Street & Market Street to Woodland Avenue. and Audit, Compliance & Privacy. Tax season is upon us, and so are the scammers who want your refund and personal information. Efforts to prey upon you through tax-related scams often increase during this time of year. The good news is that there are strategies you can use to protect your information.